Friends in Sonoma Helping (F.I.S.H.) is a caring bridge for the increasing number of Sonoma Valley neighbors that need help. We are a group of 160+ volunteers who are happy to serve all who are in need. F.I.S.H offers immediate emergency assistance keeping families from becoming homeless or going hungry. The unique contribution of F.I.S.H. to Sonoma Valley is its ability to coordinate the individual human response to meet the immediate basic needs of our neighbors. Our community cannot be complete as long as part of it is suffering from hunger, isolation or threat of homelessness. F.I.S.H. reaches out to address the most immediate needs of our neighbors while longer term solutions can be found. 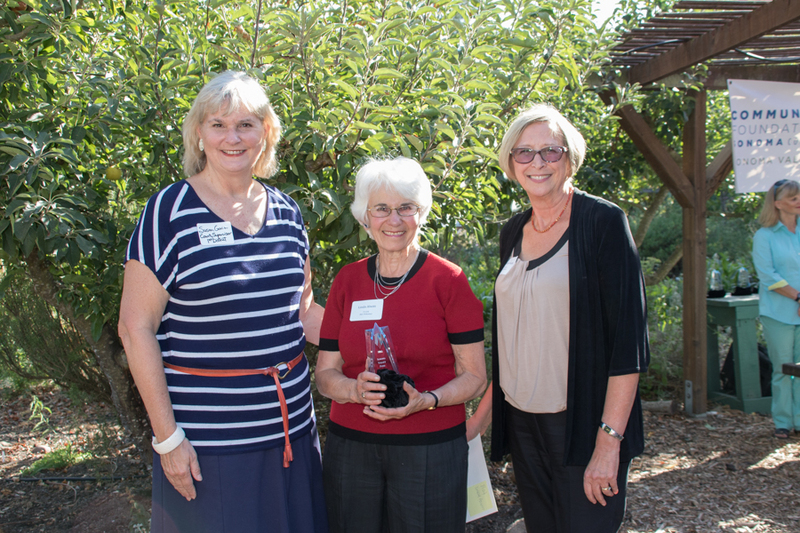 To learn more, visit F.I.S.H..
Linda shown here with Supervisor Susan Gorin and Sandy Piotter, FISH's Board President. Linda’s volunteer FISH work includes Dispatcher, Grant Writer, Web Master, Data Coordinator, Steering Committee Member, Sonoma Severe Weather Shelter secretary and organizational innovator. Linda is one of those special volunteers who bring an entire constellation of skills to her volunteer work. As a retired professor, Linda brings research, technical and analytical skills to every task. However, it is her concern and caring for people that transform every task she undertakes into improved services for those in need in Sonoma Valley.